Ukraine is a country split between East and West in political as well as economic terms. Unless these divisions are overcome – including some normalisation of relations with Russia - it will be difficult to achieve any lasting improvement of an economy burdened by structural weaknesses, corruption and war. 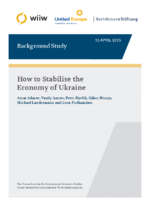 The study, drafted by wiiw on behalf of United Europe and Bertelsmann Stiftung, outlines the ways how to reform the Ukraine's economy and put it on the sustainable growth path. Under the crucial assumption that peace is restored, wiiw elaborated policy recommendations in areas of institutional reforms, macroeconomic stabilisation, foreign trade, integration and FDI policies, as well as industrial and regional developments.